The first arena giveaway will be at the Anaheim Ducks game on Friday, November 23. The promotion will visit seven other NHL teams — and possibly several others — plus two AHL teams. 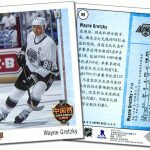 Here is information on every team that is giving away these unique hockey cards, and how to get them. Who: All fans in attendance. What: A pack of six cards, plus one promotional card. Checklist: Ryan Getzlaf, Adam Henrique, Andrew Cogliano, John Gibson, Corey Perry and Cam Fowler. 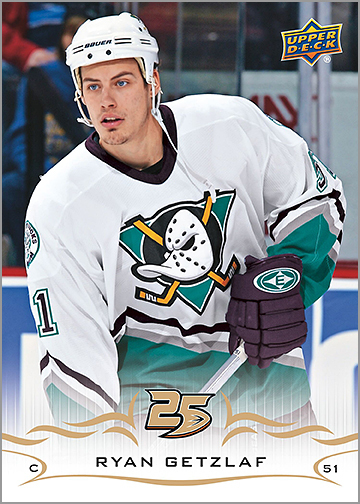 Notes: These cards feature different jerseys throughout the team’s 25th anniversary, and replace the Ducks logo at the bottom with a special “25” logo. Cards of Ryan Getzlaf, Adam Henrique, Josh Gibson and Cam Fowler use different photos than those found on their 2018-19 Upper Deck Series One cards, while cards of Andrew Cogliano and Corey Perry are not in Series One (but will probably be in Series Two, possibly with different photos than these). Who: The first 19,000 fans in attendance. What: A pack of six player cards, plus two promotional cards. Evgeny Kuznetsov and T.J. Oshie. 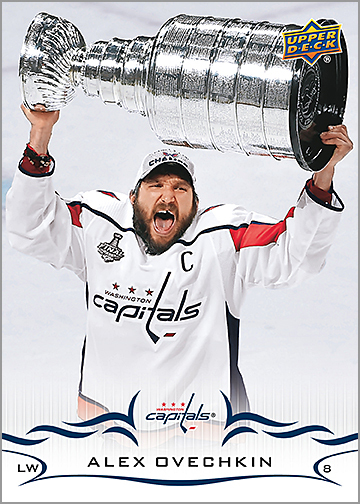 Note: Players are shown celebrating with the Stanley Cup, so the photos used will differ than the photos used in Upper Deck Series One. Who: All kids 12 and under in attendance. What: A pack of six player cards, plus one promotional card. Checklist: Nick Foligno, Sergei Bobrovsky, Seth Jones, Cam Atkinson, Zach Werenski and Artemi Panarin. Note: Cards of Nick Foligno, Sergei Bobrovsky, Seth Jones and Cam Atkinson use the exact same photos as their cards found in 2018-19 Upper Deck Series One. Zach Werenski and Artemi Panarin are not in Series One, but will most likely be in Series Two, and will most likely use the same photos. What: A pack of seven player cards. Checklist: Jonathan Drouin, Carey Price, Andrew Shaw, Jeff Petry, Paul Byron, Victor Mete and Tomas Plekanec. 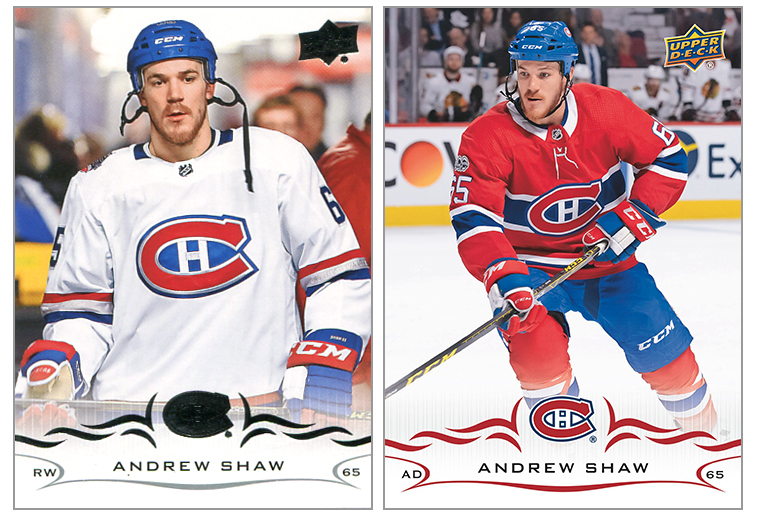 Notes: Cards of Andrew Shaw and Jeff Petry use different photos than their cards found in 2018-19 Upper Deck Series One. The card of Jonathan Drouin uses the same photo, but the card orientation was changed from horizontal to vertical. 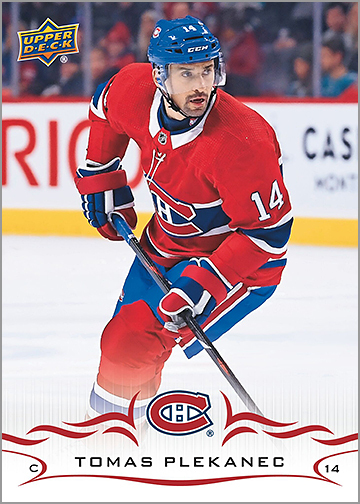 The Carey Price giveaway card uses the same photo as the Series One card. Victor Mete, Paul Byron and Tomas Plekanec are not found in Series One, and since Plekanec retired recently, he probably will not be found in this year’s Series Two. Who: The first 10,000 fans in attendance. What: A pack of six player cards. Checklist: Patrice Bergeron, Charlie McAvoy, David Pastrnak, Zdeno Chara, Brad Marchand and Tuukka Rask. 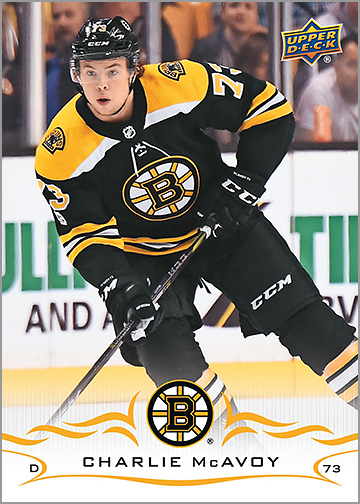 Notes: The Charlie McAvoy giveaway card uses a different photo than the one used on his 2018-19 Upper Deck Series One card. The Patrice Bergeron giveaway card uses the same photo that is used on his Series One card. David Pastrnak, Zdeno Chara, Brad Marchand and Tuukka Rask are not in Series One, but will all probably be in Series Two and may or may not use the same photos as these giveawya cards. Who: All kids in attendance. What: A pack of seven cards — six players and one mascot. Checklist: Claude Giroux, Wayne Simmonds, Travis Konecny, Sean Couturier, Ivan Provorov, James Van Riemsdyk and Gritty. Notes: Cards of Giroux, Couturier and Provorovuse different photos than what were used on their Upper Deck Series One cards. 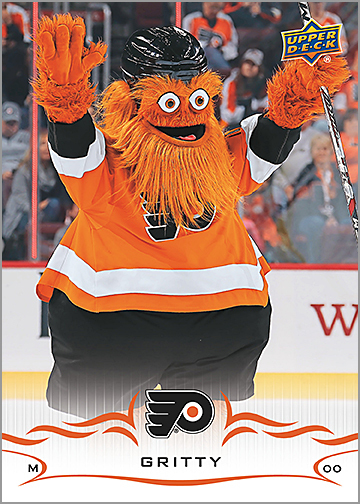 The Gritty card uses a different photo than what was previously used on other giveaway cards of Gritty. 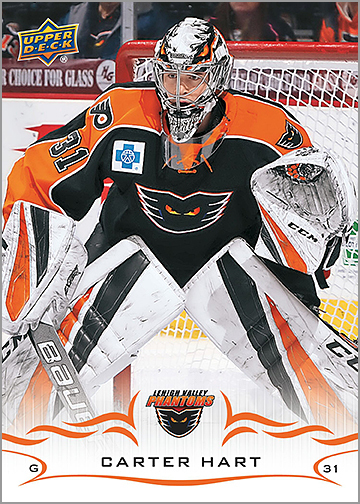 The Konecky card uses the same photo that was used on his Upper Deck Series One card. Simmonds and Van Riemsdyk were not in Series One, but will probably be in Series Two and may or may not use the same photos as these giveaway cards. What: A pack of nine player cards. 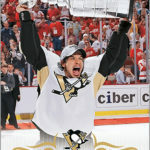 Checklist: Sidney Crosby, Egeni Malkin, Kris Letang, Marc-Andre Fleury, Jordan Staal, Chris Kunitz, Sergei Gonchar, Max Talbot and Bill Guerin. 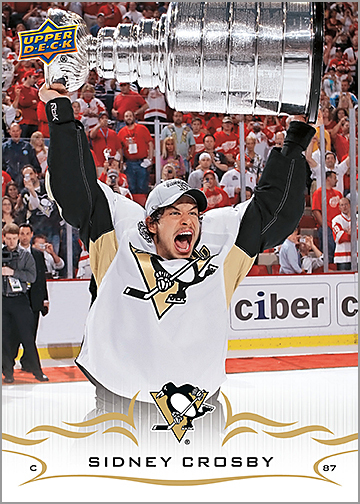 Notes: Features players from the 2009 Stanley Cup Championship team and uses throwback photos from that season. Who: The first 16,000 fans in attendance. What: A pack of seven player cards, plus one promotional card. Connor Hellebuyck, Dustin Byfuglien and Josh Morrissey. 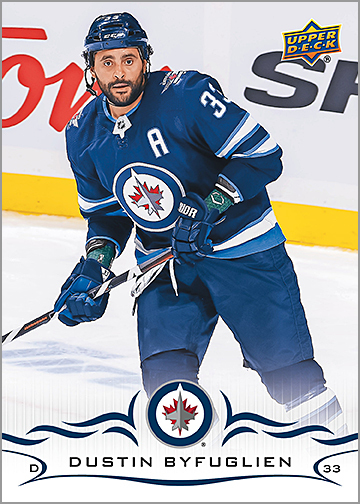 Notes: Cards of Wheeler, Connor, Hellebuyck and Byfuglien use different photos than their Upper Deck Series One cards. 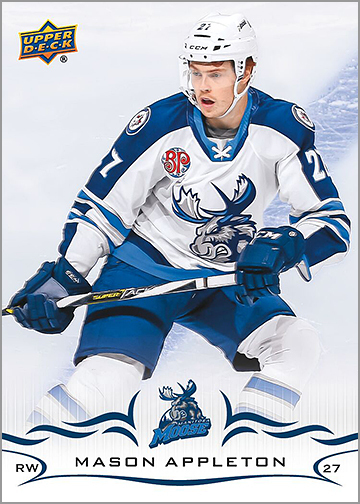 Scheifele, Laine and Morrissey were not in Series One, but will probably be in Series Two and may or may not use the same photos as these giveaway cards. Checklist: Max Domi, Jesperi Kotkaniemi, Phillip Danault, Shea Weber, Mike Reilly and Artturi Lehkonen. Notes: I do not have images of these cards. So I do not know if the photos differ from the photos used on the Upper Deck Series One/Series Two cards of these players. What: A pack of five player cards. Checklist: Jack Eichel, Casey Mittelstadt, Jeff Skinner, Conor Sheary and Sam Reinhart. 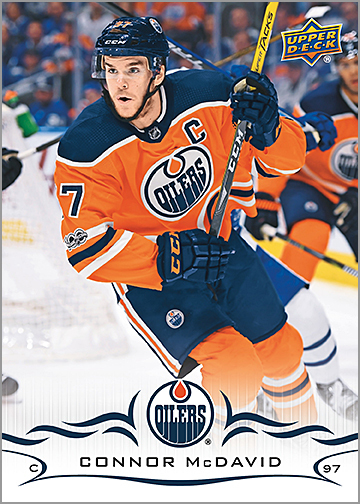 Notes: A sixth card, of 2018 first-overall pick Rasmus Dahlin, is available at Dave & Adams Card World, located at 8075 Sheridan Dr., Williamsville, NY 14221. Checklist: Johnny Gaudreau, Matthew Tkachuk, Sean Monahan, Mike Smith, James Neal and Elias Lindhom. 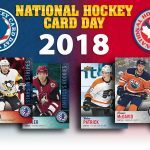 Notes: Cards of Gaudreau and Smith use the same photos found on their Upper Deck Series One cards. 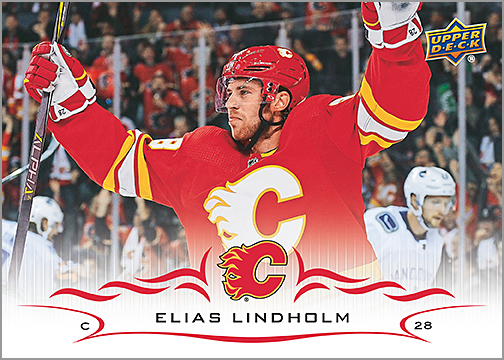 Tkachuk, Monahan, Neal and Lindholm are not in Series One, but will probably be in Series Two and may or may not use the same photos as these giveaway cards. What: A pack of seven cards — six players and one mascot. A bonus card will also be available at the team store. Checklist: Steven Stamkos, Nikita Kucherov, Victor Hedman, Andrei Vasilevskiy, J.T. Miller, Ondrej Palat, Brayden Point and Thunderbug. Notes: The Brayden Point card is available at the Lightning team store during the game. Most likely, you will have to purchase a pack of Upper Deck hockey cards to get it. Cards of Stamkos, Vasilevskiy and Point use the same photo as their Upper Deck Series One cards. 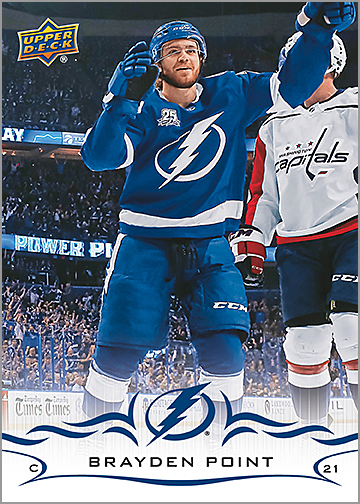 Kucherov, Hedman, Miller and Palat are not in Series One, but will probably be in Series Two and may or may not use the same photos as these giveaway cards. Checklist: Alex DeBrincat, Jonathan Toews, Patrick Kane, Duncan Keith, Brent Seabrook and Brandon Saad. 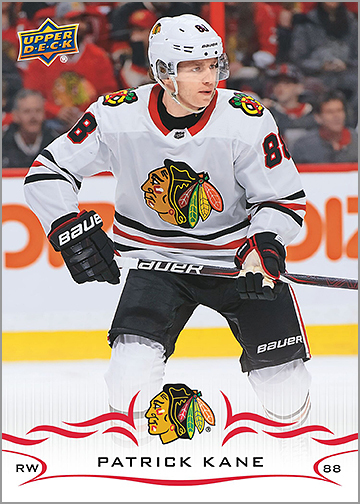 Notes: Cards of Patrick Kane and Brandon Saad use different photos than those used on their Upper Deck Series One cards. What: A pack of player cards, most likely six. Checklist: Colin McDonald, Phil Varone, T.J. Brennan, Philippe Meyers, Alex Lyon and Carter Hart. 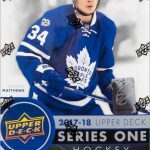 Notes: These will use the Upper Deck Series One/Two design, but feature AHL players, making this team set truly unique. Also, goaltender Carter Hart — who is having a heck of a rookie season with the Philadelphia Flyers — is included in this set. Checklist: Mason Appleton, Nelson Nogier, C.J. Suess, Michael Spacek, Cameron Schilling and Logan Stanley. 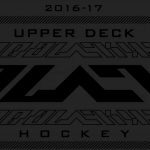 Notes: These will use the Upper Deck Series One/Two design, but feature AHL players, making this team set truly unique. It was originally reported that only 3,000 of these sets would be given away; however, it appears that 10,000 of these sets will be issued. Checklist: Sebastian Aho, Teuvo Teravainen, Justin Williams, Jaccob Slavin, Brett Pesce and Dougie Hamilton. 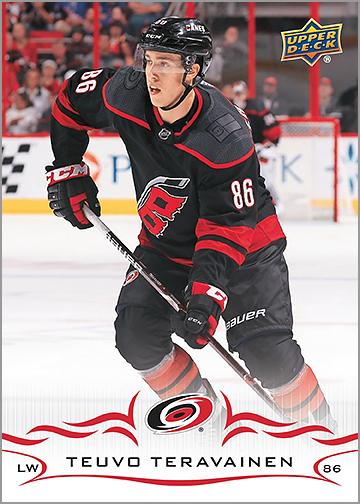 Notes: A 7th card, of Andrei Svechnikov, is available that night with a purchase from the Hurricanes’ team store at the arena. Who: The first 13,000 fans in attendance. Checklist: Will Butcher, Nico Hischier, Kyle Palmieri, Sami Vatanen, Andy Greene and Travis Zajac. 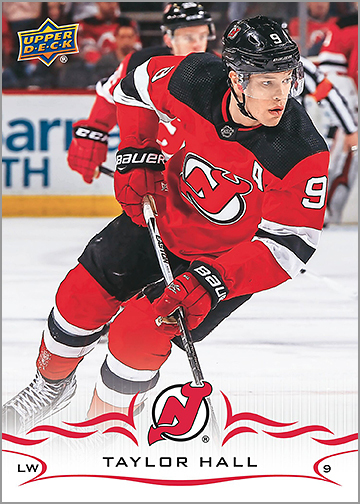 Notes: A bonus card of Taylor Hall is available that night from the Devils’ team store at the arena. Who: The first 15,000 fans in attendance. Checklist: Mark Stone, Matt Duchene, Brady Tkachuk, Craig Anderson, Colin White and Thomas Chabot. 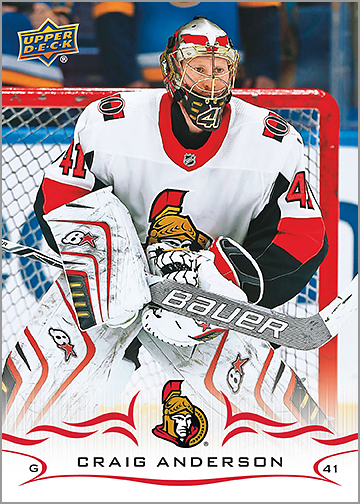 Notes: Cards of Mark Stone, Craig Anderson and Thomas Chabot use different photos than the photos used on their Upper Deck Series One cards. Who: The first 5,000 fans in attendance. What: A pack of eight player cards. Checklist: Cal O’Reilly, Kaapo Kahkonen, Kyle Rau, Gerry Mayhew, Sam Anas, Colton Beck, Andrew Hammond and Brennan Menell. 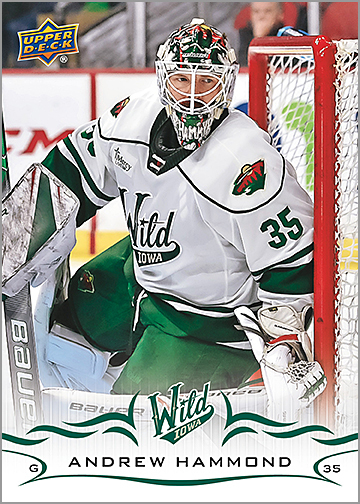 Notes: With only 5,000 sets being given away, the Iowa Wild team set is the set with the smallest print run. Who: Patients at local hospitals. 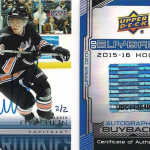 What: A pack of six player cards, plus an additional card of the Oilers’ mascot, Hunter. Checklist: Connor McDavid, Leon Draisaitl, Cam Talbot, Ryan Nugent-Hopkins, Adam Larsson, Zack Kassian and Hunter. Note: These cards will be given away during team visits to local Edmonton hospitals. Cards of McDavid, Draisaitl, Talbot and Nugent-Hopkins use the same photos as their Upper Deck Series One cards. Larsson and Kassian are not in Series One, but will probably be in Series Two and may or may not use the same photos as these giveaway cards. Who: Kids at local schools and youth camps. Checklist: Vladimir Tarasenko, Ryan O’Reilly, Jaden Schwartz, Alex Pietrangelo, Joel Edmundson and Brayden Schenn. Notes: The cards will be given away during team visits to local St. Louis schools and youth camps. Cards of Schwartz, Edmonson and Schenn use different photos than their Upper Deck Series One cards. The Tarasenko card uses the same photo that was used on his Series One card. 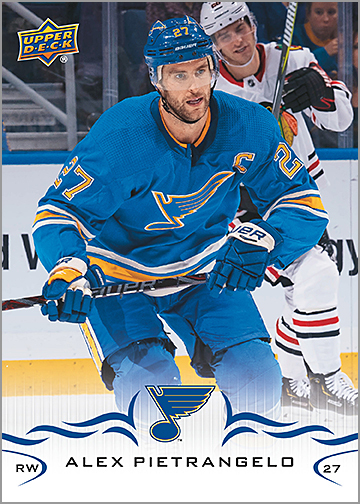 O’Reilly and Pietrangelo are not in Series One, but will probably be in Series Two and may or may not use the same photos as these giveaway cards. One thing to note is that in year’s past, most of these team sets consisted of seven cards. The first six cards were wrapped in cellophane and handed to an attendee when they entered the arena. The seventh card could only be acquired with a purchase of an Upper Deck product from the team store, but most usually did not bother doing that, making the last card always the toughest to find. 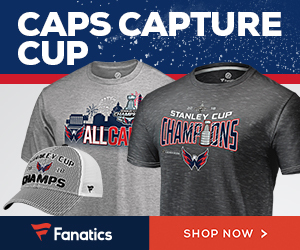 This year, some — but not all — teams will have a “final” or “bonus” card that you need to get from the team store by making a purchase. 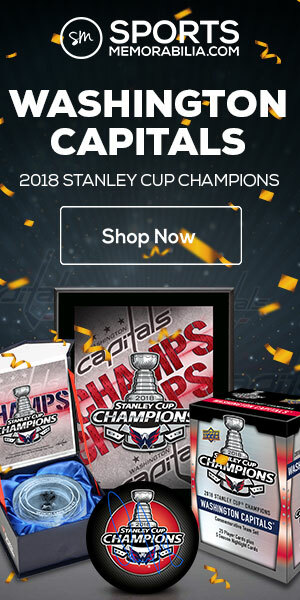 Be sure to subscribe to this site (the sign up on the right) and follow me on Twitter to stay informed about future Upper Deck hockey card giveaways. 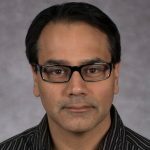 NOTE: This article was updated on April 6, 2019.